I’m Heading to the Thor: Ragnarok LA Red Carpet Premiere! I can’t believe it! MARVEL invited me to attend the Thor: Ragnarok LA Red Carpet Premiere! You have no idea how totally stoked I am! Thor is my #1, my numero uno, my all-time favorite MARVEL superhero. But let’s be for real, we all know he’s a God. I’ll also be attending the In-Home Release Dinner for Disney/Pixar’s Cars 3 on Blu-ray and interviewing filmmakers from the new Disney Jr. animated series Vampirina! So much awesome in three days I can hardly even sit still! All Thor: Ragnarok images, poster, and trailers. Some movies just stay with you. My son grew up to Cars, so there’s a special tie to this film for me as it reminds me of his early childhood. I’ve always been drawn to Radiator Springs in the film. It has that classic atomic age design that I love! A couple years ago during D23 EXPO 2015, I was able to visit Radiator Springs at Disney California Adventure for the very first time. Let me tell you, I was like a moth to a flame in this place. I felt like I was inside the movie! It was AMAZING! I just found out that I’m heading back to Radiator Springs, AKA Cars Land, for the In-Home Release Dinner for Cars 3! Call me a fangirl but I can’t even begin to describe how happy this makes me! I hope you get the chance to follow along because I’ll be sharing loads on my Instagram story! But it gets even better!!! Not only will I be in one of my most favorite places on earth, but Radiator Springs will be fully decked out for Haul-O-Ween for the first time ever! More information about Haul-O-Ween at Cars Land can be found on the Disneyland News site. After Cars Land I’ll be heading over to the Guardians of the Galaxy Breakout ride which is also themed to Halloween with “Monsters After Dark“. I am a huge GOTG fan, so this is another bucket list one for me! I have to experience this ride since its opening earlier this year. I AM STOKED! I don’t have a lot of details on this yet, I’ll update as soon as I can. I do know that it’s a brand new show that aired just yesterday. You can watch it on the Disney Junior app here: on iOS and Android. The show is adorable, bringing all the cute Gothic feels in full Disney/Pixar form. If I had a little girl in this age group this would be on the TV all day. No doubt! Hopefully, I’ll be interviewing the filmmakers on this one. I love interviewing animators, they are so much fun! As a huge Star Wars fan, I am super excited to be meeting with LittleBits to build my very own Droid from their all new Inventor Kit. I’ll update this information as soon as I have it! I’ve seen them for sale at Walmart, but you can order one right now on Amazon here! 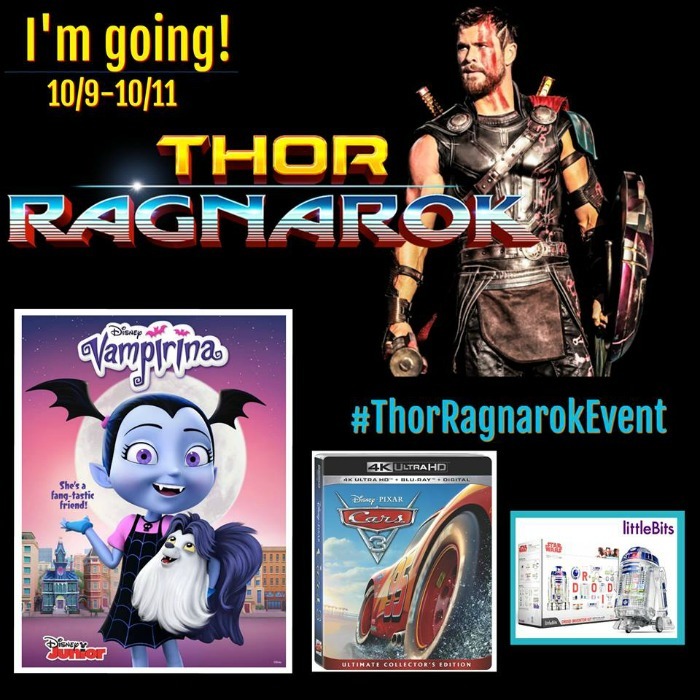 Tuesday, October 10th – Thor: Ragnarok LA Red Carpet Premiere!! So why is MARVEL’S Thor so special to me? Well, a long time ago, before I ever got into comics, before the MARVEL Cinematic Universe was a thing and before I was a blogger, I fell in love with Norse Mythology. There’s something magnetic about the Bifrost Bridge (also known as the rainbow bridge), the Valkyrie, Valhalla, and Asgard. All of it, it’s captivating. My fascination for Thor and Odin has grown since my college years, inspiring me to pursue my passion for legends and folklore. It also inspired great authors like J.R.R. Tolkien to create Middle Earth, C.S. Lewis to Create Narnia and of course MARVEL to create The Mighty Thor. It’s this adaptation which brought me into the world of comics. And, of all the superheroes, Thor is the only one who was a God and can be traced back to ancient rock carvings in places like Denmark, Sweden, and Norway. I literally can not wait to experience this! And I can’t wait to share it with you! The Thor: Ragnarok LA Premiere is going to be Hammer of Thor level EPIC! Roundtables with Karl Urban (“Skurge”), Rachel House (“Topaz”) and Director Taika Waititi (also “Korg”). Press conference to follow panel with Chris Hemsworth (“Thor”), Mark Ruffalo (“Bruce Banner / Hulk”), Tom Hiddleston (“Loki”), Tessa Thompson (“Valkyrie”), Jeff Goldblum (“Grandmaster”), Karl Urban (“Skurge”), Rachel House (“Topaz”), Director Taika Waititi and Producer and President of Marvel Studios Kevin Feige! Be sure you’re following the live interview tweets on @FairytaleTVLR and @geeklifehappens and check out the Instagram story action on @heroesandunicorns! Thor: Ragnarok hits theaters November 3! Disney/Marvel is sending me on an all-expenses-paid trip to LA for this experience. This in no way shapes my opinions in this article. This article contains affiliate links at no cost to you. All opinions are my own. Can’t wait to meet you this coming week. I’m with you, excited to take part in any and all of it! I probably won’t sleep for a week. THanks for swinging by! Looking forward to it too! I am so excited to go on Guardians of the Galaxy Mission Breakout with you!!!!! I haven’t been to Disneyland since 2002 and I can’t wait to see everything new there. Radiator Springs looks incredible. Great stuff! I’m looking forward to hanging out with you for the amazing event.